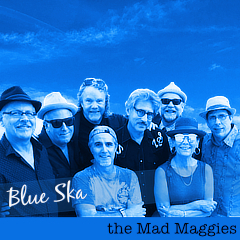 We have been very busy here at Mad Maggies Central getting prepared for our “Alive and Squeezing” Tour with TDA (Those Darn Accordions). The dates have filled in nicely. Our fantastic “alive and squeezing” creature was drawn by Chiara Sarter, daughter of Mad Maggies’ bassist Tim Sarter. She is an amazing artist! We are thinking t-shirts. What do you think? This is our first time playing this cool “martini bar – ultra lounge” in lovely downtown Benicia. The Rellik takes very good care of its clientele. There is never a cover charge. Irish singer/songwriter Sin Silver opens the evening at 5pm. We take the stage at around 8:30pm and play until around 11pm. Good craic! We want to do more tours and that depends on our creating buzz and filling venues with happy music lovers. So we are doing plenty of guerrilla marketing. We could use your help. Simply encourage your friends, families, co-workers, colleagues, enemies, ex-lovers and complete strangers to come see live music being performed before their very eyes. There’s nothing like it. 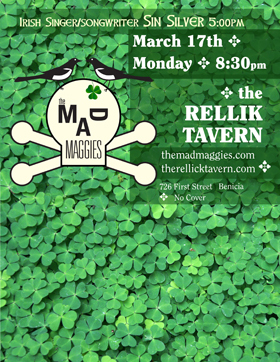 Alberta Street Pub, alive and squeezing, Johnny B's, Mad Alert, Palm's Playhouse, Rancho Nicasio, Sam Bond's, the Rellik Tavern, Those Darn Accordions.